RGCD: Assembloids is now FREE! 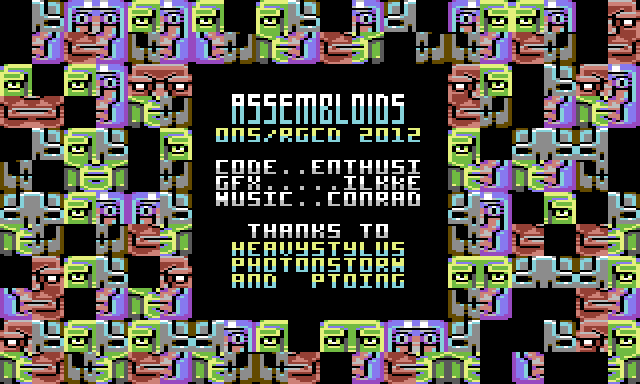 The previously retail-only enhanced version of RGCD and Onslaught's Assembloids is now available for free download for your emulator or Commodore 64! An acclaimed frantic-paced puzzle/reaction game from Enthusi, iLKke and Conrad that deservedly took second prize in the 2012 RGCD game development competition, Assembloids is all about assembling robot faces from four sets as quickly (and completely) as possible against an increasingly tight time limit. This retail version is further enhanced over the original competition build, with a refined difficulty curve and highscore verification codes. Of course, if you want a physical copy of the games for your collections (and who wouldn't?) then it is still available to buy on cartridge from our shop here, and tape users can buy the game from Psytronik Software.